Beeswax, Yellow - small 4" - Penn Herb Co. Ltd.
Beeswax, Yellow - small 4"
Beeswax is the ideal base ingredient for your natural hair and skin care remedies. Blend with skin-nourishing oils to make moisturizing creams, ointments, lip balms and soaps. 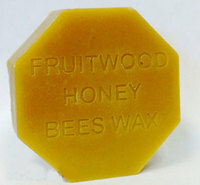 Yellow Beeswax imparts a golden color and hint of honey flavor. Melt together in a double boil. Remove from heat and add honey. Pour into a clean container and let cool. NOTE: Beeswax is secreted by the worker honeybees and is used in the construction of honeycomb. Skin care products: creams, lotions, ointments, salves, lip balms, soaps; solid perfumes; hair care (conditions scalp, for locks). Candles - Beeswax is the preferred ingredient because it lasts longer than paraffin and already has a naturally pleasing scent; for soap-making (increases hardness). Melt beeswax in a double boiler or a glass container (aluminum may affect the color). Beeswax melts at approximately 145 degrees (Fahrenheit).